The following is an excerpt from Silent City on a Hill: Picturesque Landscapes of Memory and Boston’s Mount Auburn Cemetery by Blanche M. G. Linden, pgs. 252- 253. Improvements in public transit brought visitors in greater numbers. Initially, hourly runs by the Cambridge Stage Company from Boston to Harvard made Mount Auburn, a mile and a half to the west, accessible to any who would walk the short distance, accounting for the throngs that so annoyed proprietors. In 1834 the first large-capacity horse-drawn omnibuses went into service in Cambridge. 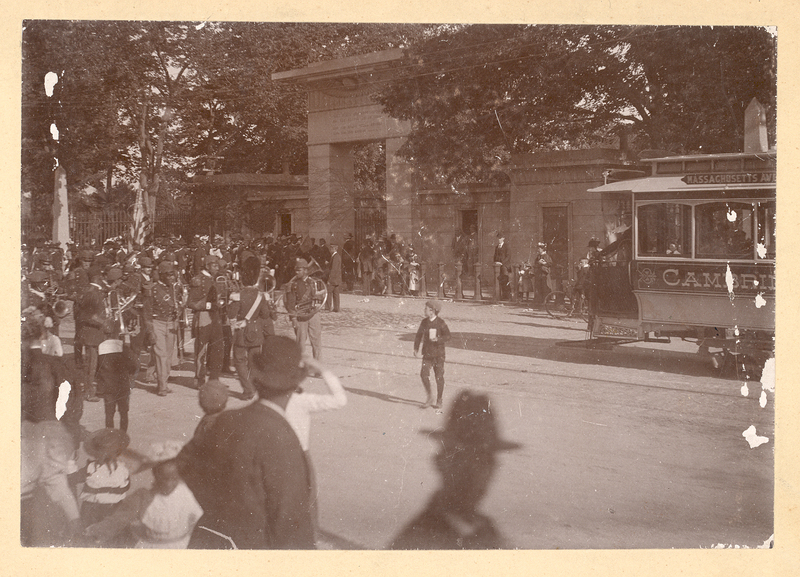 By 1838 several regular lines offered hourly runs between Harvard and the Cemetery gate. The route ending at the Cemetery was so popular that in 1838 the town of Cambridge renamed the old road Mount Auburn Street, and Watertown followed suit. The station built in 1847 at Mount Auburn’s northwest corner provided service by the Fitchburg Railroad and the Cambridge Branch Railroad to and from points west. The Cambridge Horse Railroad, the first in New England, extended its service in 1856 from Boston’s Bowdoin Square through Cambridge to Mount Auburn’s gate, making it the first central line in the metropolitan network and further increasing public access. Its cars made 175 trips each way every day at fifteen-minute intervals until 11:30 pm. Wrought-iron rails assured a smooth ride along tree-lined Brattle Street past the Longfellow House. In 1863 another line brought visitors past Fresh Pond to Mount Auburn via Garden and Craigie streets. Jacob Bigelow, like many proprietors who did not own carriages, used the horse railroad. The low fare made frequent visits possible, unlike the cost of hiring a hack. The corporation supplied trustees with tickets for the new mass transit. 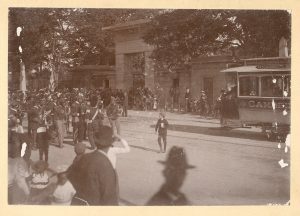 Although trustee Martin Brimmer wanted to limit admittance to exclude the public who arrived on the horse railway, cooperation existed between the transit company and the Cemetery. The company’s three founders owned burial lots, and two became trustees. 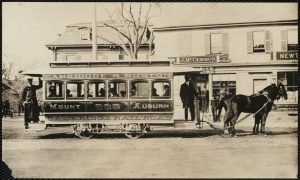 Perhaps that accounted for the higher fare to Mount Auburn than to other stops, about which proprietors complained. The company kept its stables near the Cemetery with room for thirty-five cars and 220 horses. Top image: Cambridge & Boston horse-drawn railway car headed from downtown Boston to the Mount Auburn terminus. Engraving by John Andrew for Ballou’s Pictorial, 1856. Visitors gathered in front of Mount Auburn’s Egyptian Revival Gateway, ca. 1870 – 1900 cabinet card. Were there stations or Depots along the way. Did the car stop at street corners? Where and how did passengers board and depart?